Record 1 to 100+ TV shows at a time. Record selectively or 24/7. From antenna, cable or satellite. Set it, forget it and let SnapStream handle the rest. Schedule recordings from the program guide, based on specific episodes or channels. For example: record this episode, record all episodes or record everything on this channel 24/7. Record all the channels available through your cable or satellite provider. SnapStream can ingest a variety of TV sources: traditional cable, satellite, antenna (over-the-air ATSC), QAM, ASI, IPTV, DVB-T and PAL. 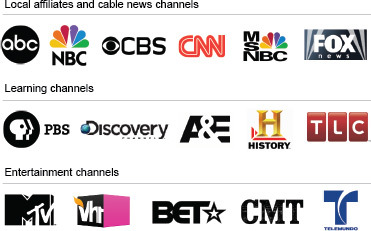 Record all the channels available through your cable or satellite provider. SnapStream can ingest a variety of TV sources: traditional cable, satellite, antenna (over-the-air ATSC), QAM, ASI, IPTV, DVB-T, PAL and RTMP NEW. Ars Technica calls it, “the most amazing TV-guide we’ve ever laid eyes on.” Grab it. Move it. It’s all interactive. 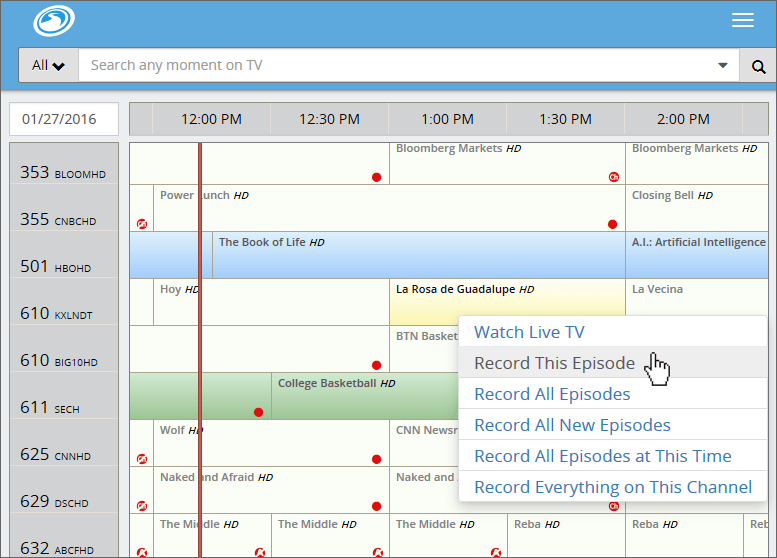 Schedule recordings from here, manage conflicts, or tune in to watch live TV. 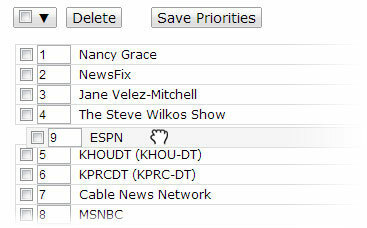 Program guide data updates daily, with 2 weeks of future listings. Every upcoming recording job has a priority, from the #1 most critical to the least. SnapStream always alerts you of scheduling conflicts, so you can re-prioritize on the fly and keep things flowing. In addition to scheduling from the program guide, SnapStream has manual, time-based guide and 24/7 recording options. 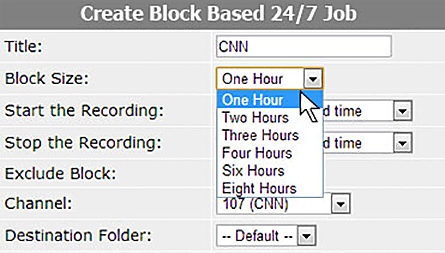 For example: SnapStream can record CNN 24/7 and divide that job into 1 hour blocks, resulting in individual video files. For 24/7 recording jobs, you can set specific hours of the day to record and blocks of time to exclude. 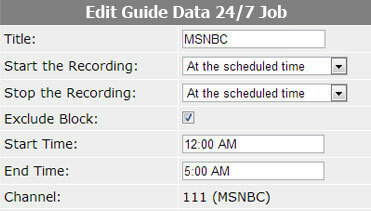 For example: SnapStream can record MSNBC all day, but exclude the hours of midnight to 5 a.m.